1. You can’t have too many clamps. 2. If you have too many clamps, see rule one. I know how some of you feel about HF and Pittsburgh tools, but I gotta say that these clamps are wonderful. They come in just the right sizes for what I need and they clamp tight and don’t scar the work. and 4 12”. Total cost with shipping $36. You just can’t beat that price on an all metal cushioned clamp. I will say, they are not for one handed use like a ratchet clap, but with a little forethought you can have it adjusted to what you need. Sorry about the miss-label of the clamp, I have no idea where that ratchet clamp title came from. Have several myself. Work just fine. While they are not for heavy duty clamping, they are great for the price. The say they are quick release, but I would suspect that if you quick release them they’d wear out pretty quick. I prefer to unscrew them. The ratchet assembly will last longer that way. The one pictured IS NOT a ratcheting bar clamp/spreader. This is a Pittsburgh F style bar clamp. These are awesome and I have about 2 dozen. The product the description of this review is for is for the absolute worst waste of money ever made. I think they have been reviewed before so I won’t get in to it, Stay FAR away from the HF ratcheting bar clamp/spreader. If they don’t break on the first use, rest assured they will break on the second. They also have the clamping strength of a wet noodle. Lumberjoe, I meant the serrations on the end of the clamp will wear out if you use the quick release. I have these same clamps in 6”, and 36”, and the older models in 6, 12, and 24. I originally thought I would like the older ones with the wooden handles better. I find I reach for the plastic handled ones more often when I have a choice. The threaded part seems better made. They have flex to them at heavy tension that Bessey or Jorgensons dont have. They cannot exert the force of a higher end clamp, but I have a dozen or two including the wooden handled ones, and will get more sometime. They are what they are, good value clamp, but not as heavy duty as more spendy models. I’m in agreement with all, a very good clamp for the money. Some flex like stated above, but with enough of them working together, plenty good enough for most glue ups. I’ve used then recently on a set of trestle table legs, 4” X 4” made from 6/4 stock, and I was pleased with the results. I have a hard time justifying the premium price of the brand name clamps. Maybe I’m just cheap, but happy with my tools. I love these clamps, as far as flex goes I have dented wood with them by over tightening them, not sure why you would want to put more force on something than that. SirFatty,- I included a picture of the clamp I’m reviewing. 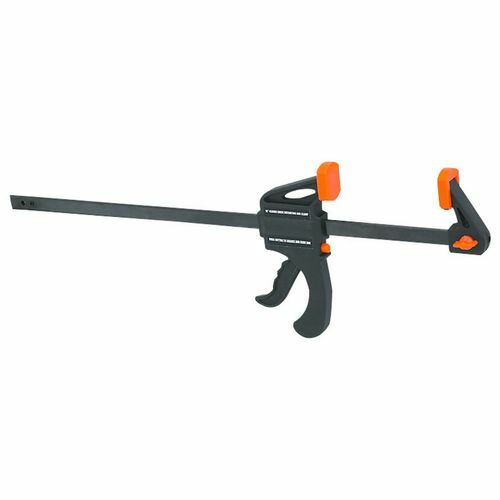 The picture above is of a similarly priced clamp but it’s a POS. I have several of them. Your pictured clamp IS NOT the “ratchet bar clamp spreader” . SirFatty has the correct picture for the description you have. Your pictured clamp is just a regular “F” clamp. Your 5 star review is crediting the wrong product and will mislead others into buying the POS ones. This guy did a review on the POS clamp / spreaders and was way to generous with a 4 star review. Ok, you’re right. I have no idea where that title came from. I selected HF and must have hit the wrong clamp in the drop down. It’s fixed now. I found that a couple drops of oil into the “pivot” part ,aids the functionality of the clamp. A few have bound up on me prior to doing that. Dusty, I thought I was going insane for a minute. I never read the titles on my own posting.